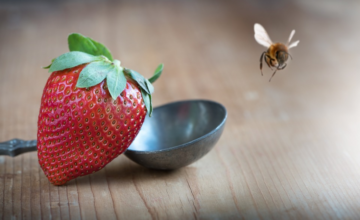 We see more and more celebrities, politicians, and everyday citizens advocating for bees and other pollinators through their activism, support, and beehive ownership. 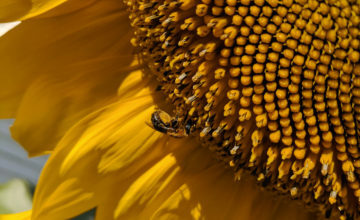 The band Blondie has recently jumped on the bee bandwagon with their new album Pollinator and campaign BEE Connected, whose mission is to raise awareness of the decline in the bee population by promoting organizations dedicated to conserving and improving the health of pollinators. A Pollinator promotional event was recently held in Los Angeles, and as the only national professional beekeeping service, The Best Bees Company was asked to supervise the use of one of the beehives we manage during the photoshoot. Our Los Angeles beekeeper Will Bristol was the featured local beekeeper alongside Frontwoman Debbie Harry. Here, he gives us a glimpse inside the bee-friendly album, photoshoot, and event. Can you describe the promotional event and organizations involved? The promotional event that followed an ET shoot and interview was both designed to promote the new album and raise awareness for honey bee health. It was graced with the presence of several honey bee activist groups. 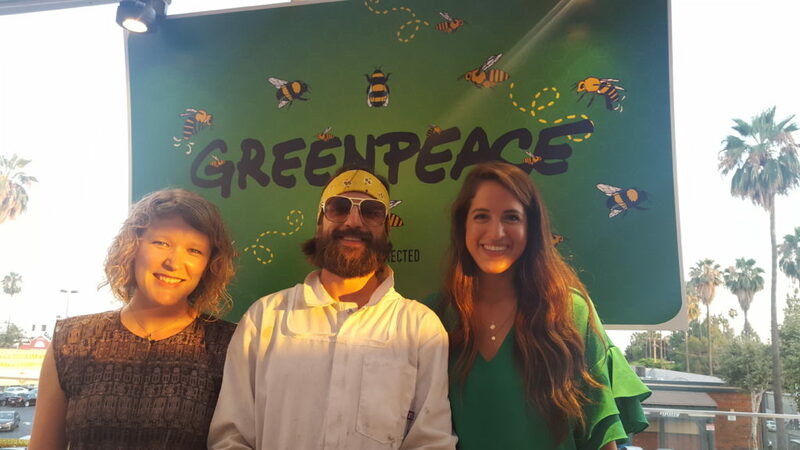 Greenpeace was present, as were non-profit honey bee activist organizations Honey Love and Pollinator Partnership. It was very inspiring to see all the projects Pollinator Partnership is working on. 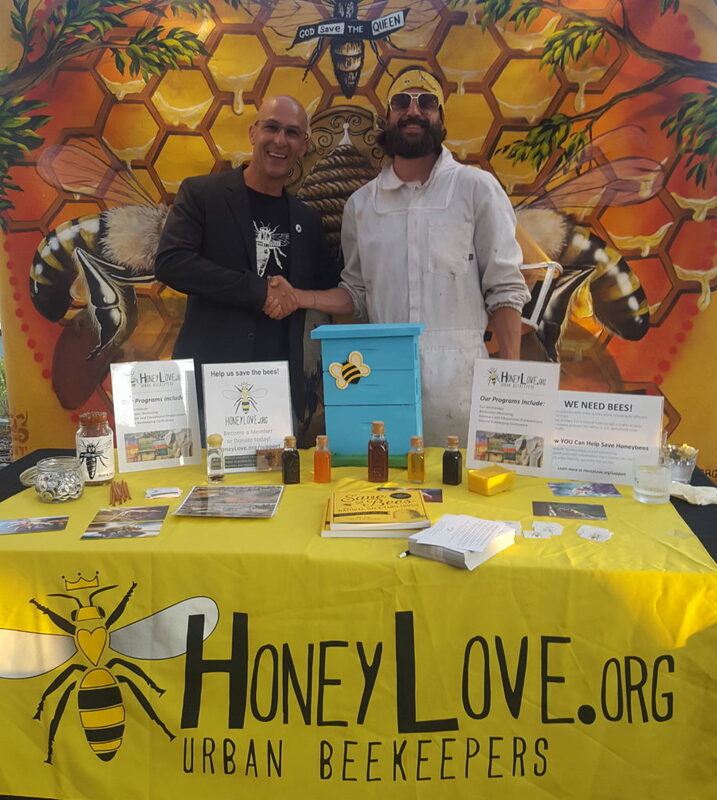 It was a pleasure to finally meet Paul Hekimian of Honey Love who was very friendly, and quite interesting to converse with. At The Best Bees Company, we generally manage Italian honey bees kept in Langstroth-style boxes, whereas Paul works with wild bees, an area I have less experience in, and would love to branch out to one day when the time is right. All in all, the conversation and ambiance of the event were both quite refreshing. Networking with other bee activists is always a great pleasure. How was The Best Bees Company involved? 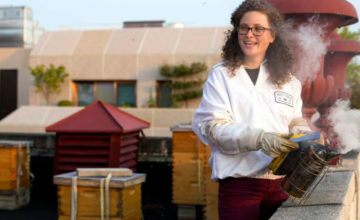 The pictures following the interview were initially intended to be taken on the roof with a live hive of bees, and so it was therefore necessary protocol to have a professional on duty. The Best Bees Company was the obvious choice. But unfortunately, since the hive was located on a section of the roof that is a rather tricky climb, the most ideal solution became to have a real beekeeper set up a mock hive on the deck of the Neuehouse. Once again, a Best Bees beekeeper was the obvious choice. It was a fun shoot. Debbie Harry of Blondie, a Langstroth hive setup, and a real urban beekeeper backed with a wondrous view of Hollywood’s hills and majestic palms just twenty minutes before sunset harmoniously provided the perfect ambiance for what the shoot was designed to encapsulate. Does Debbie Harry keep bees? We only had the pleasure of speaking very briefly during the shoot, but I believe she mentioned that she keeps beehives at her homes in both Connecticut and New Jersey. Have you heard Blondie‘s new album, Pollinator, and if so can you give us a little preview/description? What was your experience of the photoshoot like? The photo shoot was a lot of fun! It has been inspiring and motivating to see so many individuals from different walks of life feeling a sense of civic duty to raise awareness for the issue with whatever resources and skills are available to them. In this case, the power love and music.